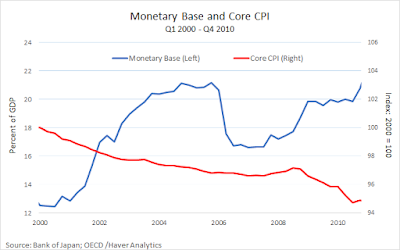 David, you give the theory for why QE hasn't worked and some supporting data. 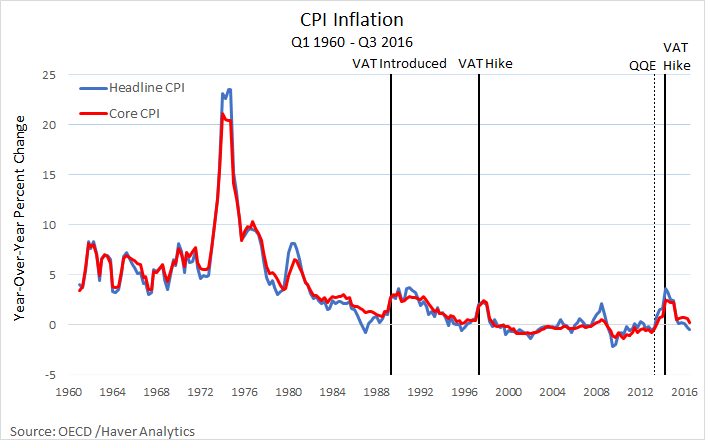 For NIRP and YCC, you only give the data, not background theory. I'm assuming that some version of neofisherism is driving your thinking? 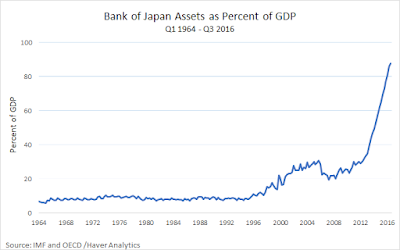 Is there some negative interest rate at which the BoJ can overcome the government's austerity measures? 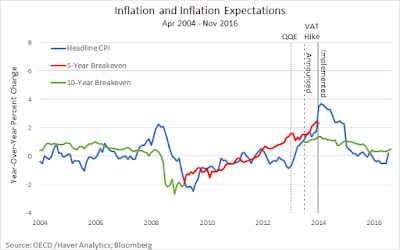 JP, I have access to some data (not free to share at the moment) on private sector inflation expectations in Japan. 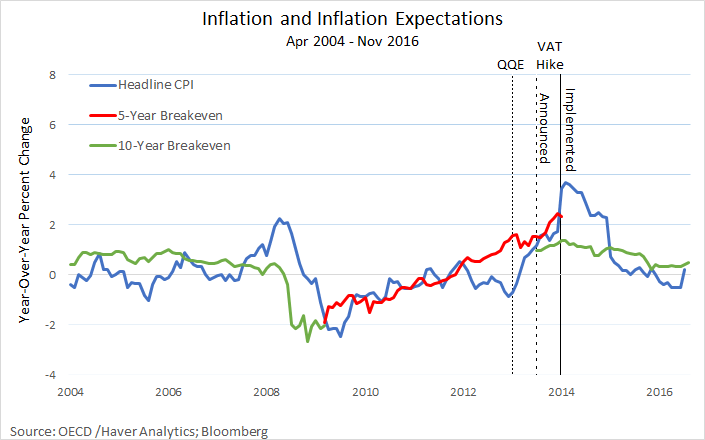 The data appears to show a clear decline in inflation expectations with the announcement of NIRP. While this is consistent with the NF hypothesis, I'm not confident that this is the (only) mechanism at work. One person in Japan (during a recent visit) told me that simply the word "negative" had a negative sentiment for Japanese -- they may have taken NIRP as a bearish signal. I don't know. As far as theory goes, in a simple OLG model with interest-bearing money, lowering the real rate of return on money in a liquidity trap scenario should be stimulative. Not so sure how important the channel is quantitatively though. In any case, none of this really matters, in my view (as subsequent posts will show). The elephant in the room is Japan's demographics and, more recently, a slowdown in productivity growth. David, great article. Do you believe the recent weakening of the yen, is just a blip like the VAT introduction? 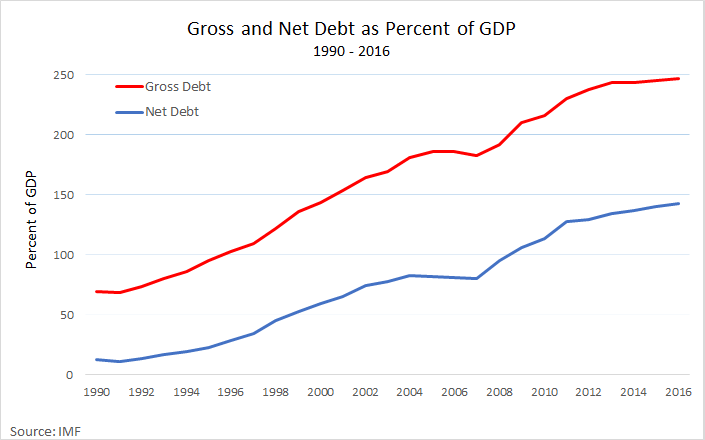 And when you say"  the growth rate in the supply of nominal government debt must rise; or  the growth rate in the demand for government debt must fall" are you implying that JGB rates drive inflation or that gov't surplus/deficit is a driver? Thanks! I guess that's just a way of saying that we don't really know what drives the nominal exchange rate. The only restriction that theory imposes is that it must follow something close to a martingale. In terms of your second question, I'm suggesting that the surplus/deficit is the driver. I've been reading Dogs and Demons (2001) by Alex Kerr, a Japanese culture expert who later worked a stint for Trammell Crow in commercial real estate in Japan. 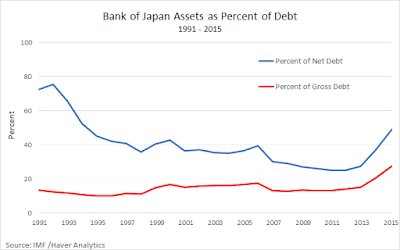 He has an interesting take on the expenditure and real side of Japanese fiscal policy. The Ministry of Finance (MOF), according to Kerr, takes funds from the postal savings system through the "Zaito" budget that are then used to subsidize bond issues by prefectural and local governments to fund white elephant projects. The Zaito is apparently not constrained by legislative budgeting. 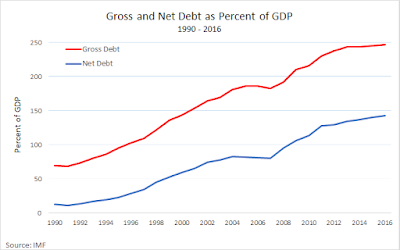 Those governments, in examples he discusses, soon become unable to meet debt service payments, which presumably affects the quality of the MOF balance sheet. Presumably this strategy would have been limited by privatization of the postal savings system pushed by PM Koizumi in the early 2000s (after Kerr's book). Those reforms were soon reversed. 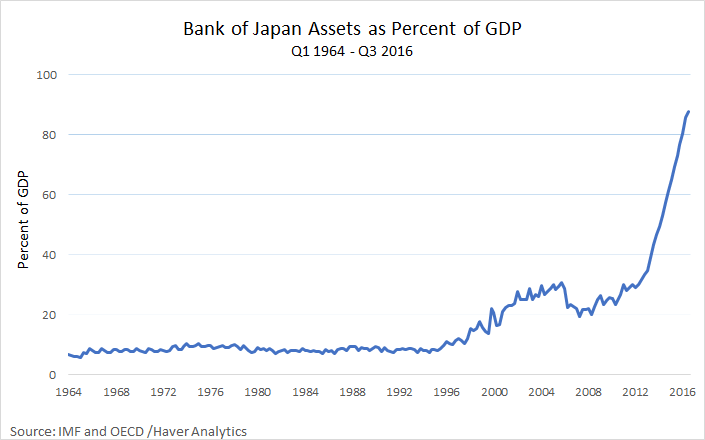 Now I'm curious about the relation between QE and MOF's Zaito balance sheet, and what that might imply for the ability of the postal savings bank to redeem deposits as Japan's population continues to age. I am half way through reading that book myself. Honestly, I'm not terribly impressed with what I've read so far. The anecdotes are amazing, of course. But I wonder if they truly do depict an accurate picture overall. I'll present some data shortly which will show that by many metrics, the Japanese economy is in fact doing fine. The main issue is demographics and, more recently, a bit of a productivity slowdown (shared by many other economies). What is your opinion of the rise in GDP and employment since the end of 2012? It looks like something big happened then, but maybe I'm projecting my biases. 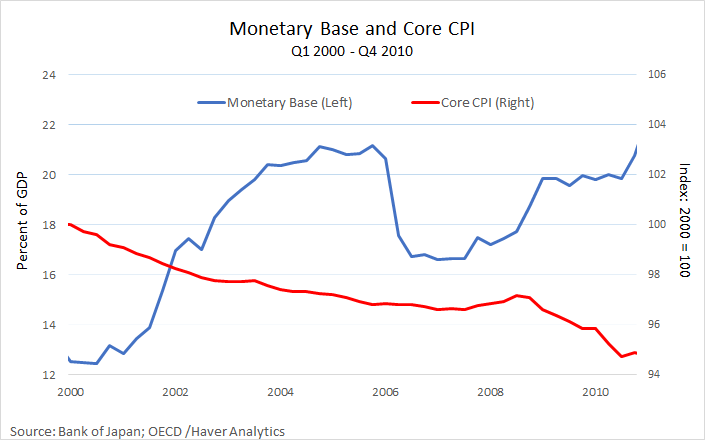 I don't think monetary policy had very much to do with it. I intend to address this shortly in a follow up post. The labor market is very tight there -- it's only a matter of time before wages start to rise, regardless of monetary policy. 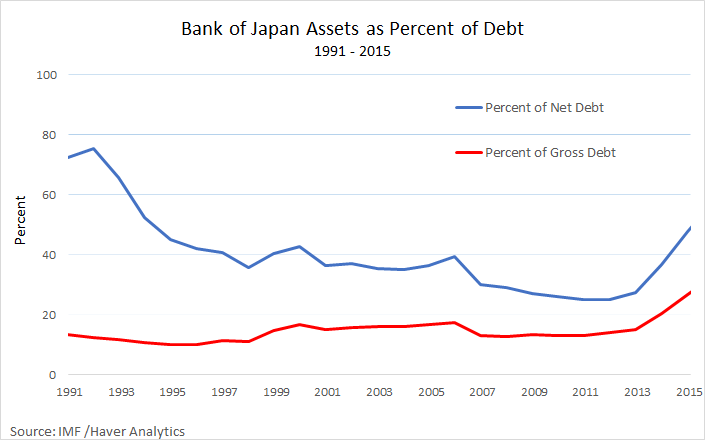 So long as the gov't keeps their pension obligations and the debt gets monetized by the BOJ, the demographics shift should hit in the form of inflation instead of simply shifting consumption from workers to pensioners via higher taxes. How could it play out any other way, barring a productivity silver bullet? I agree that more fiscal stimulus will speed things along, but what sector do you think should be crowded out? There's not much slack there. Despite the apparent tightness of the labor market, real wages continue to be stagnant or even declining, it appears. I'll look deeper into it. Thanks.